Bylines, RSS feeds, mapping and Facebook stuff: The Rapidian has some new features! Each week, a Rapidian staffer will publish a piece related to goings-on at The Rapidian, developments in the world of citizen journalism and tips for making the most of the site. Click here for past editorials. Now that the craziness of ArtPrize is behind us, we can breathe and finally tell you about the new features we have quietly launched on (and off) the site over the last couple of weeks. That's right, people, it's "New Feature Tuesday" again! 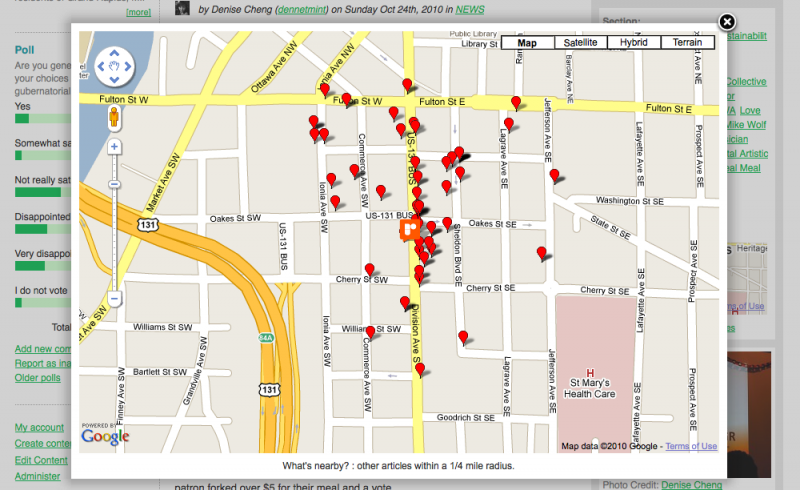 Nearby Articles is our first stab at taking related article browsing beyond the tag. Tags are, of course, a great way of grouping articles in a logical way but in the spirit of The Rapidian’s hyperlocal focus, we are constantly looking for new ways to help people get a fuller, more accurate picture of our city’s neighborhoods. Relating articles by proximity is one such strategy for achieving this. The Nearby Articles feature, which can be found on any article that has a map, expands a map of all the articles within a quarter mile radius of the article you are looking at (try it out above!). The map will include all articles posted since The Rapidian began, so it provides a complete history of a neighborhoods coverage on the site. In order for this feature to work, I must reemphasize the need for Rapidian contributors to add location information to their articles wherever appropriate. Here is a refresher on how to do that. In a total palm-to-forehead "DUH!" moment, we realized that we've never included bylines on the front page. We believe this change will reinforce the connection between the individual reporters who make The Rapidian what it is and the content they submit to the site. This is one of the main features we brought over from the ArtPrize special content page, a layout we will likely be looking to as we make a few more cosmetic changes to the site. In addition to helping readers better connect Rapidian writers with their content, we also wanted to make it easier for contributors to use that content elsewhere. So, want a small "real-life" example of how you can use RSS feeds? Well, OK! In the past we have used the general feed of all article content on the Rapidian to automatically update our Facebook page. It was a little overwhelming for us, what with all the great content y'all produce, but it could be an excellent way for any of the individual reporters or nonprofit organizations to automatically share their articles on various social media outlets. Similarly, anyone can subscribe to the personal feeds of any contributor on the site so that you can be among the first to know when they have added new content to the Rapidian. Speaking of Facebook... (If you don't use the FB please feel free to tune out for the rest of this editorial paragraph--but only this one, guys. Only this one!). We have been experimenting with different ways to deliver our weekly digest to that platform. 5 "photos of the day"
This was a pretty nice way to collect a whole week's mess of content in an easily digestible format while showing our contributors on Facebook a little love. Also, it allowed us to tag the authors so that the note would appear on their Facebook wall in in their friends' streams. However, as many of you are no doubt aware, this method has limited options for embedded images, and it can also result in quite a lengthy list. Especially these days. While having so many articles is a very nice problem to have, Denise has been experimenting with alternative ways to present this information. For the last two weeks she has formatted the digest as a publicly accessible photo album. As a photo album, we can highlight the stories in a more graphically interesting way-but more importantly, as a fan of The Rapidian on Facebook, you can now help us by tagging the appropriate folks for each story. Though our reach may be wide, we are not yet Facebook connected to everyone contributing, quoted, or mentioned for each article. So, we need your help, Rapidians. Tag the photos in the digest album with anyone who is related to the article. Check out the last two weeks and let us know what you think. So there you have it: the newest features on The Rapidian. If you have any questions about these features, or suggestions on how to improve them, please don't hesitate to comment below or contact us at [email protected]. We'd love to hear from you.